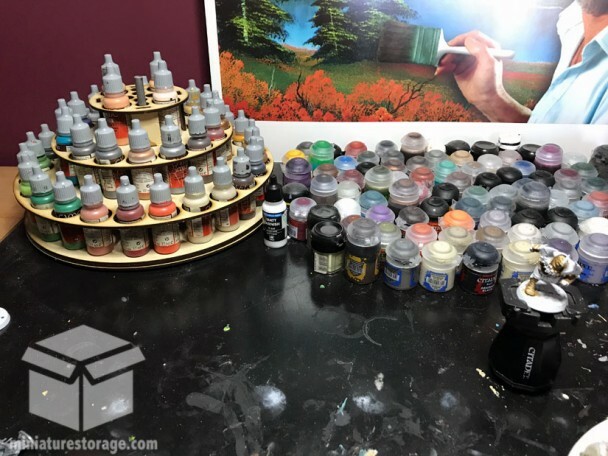 I wrote an article previously that covers a variety of paint storage ideas. 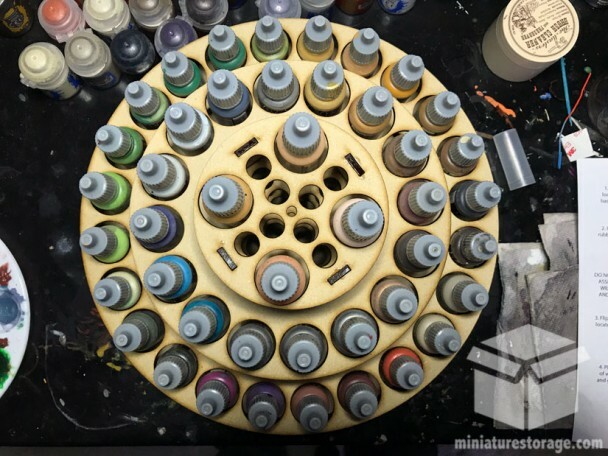 In that article I covered The Lazy Painter, a Lazy Susan style painting rack for dropper paint bottles. Well, the owner of MakerHorde contacted me to send me The Lazy Painter to check out. Who was I to say no? Like most of you, I have some dropper bottles for paint and I also have the Citadel pots for paint. Also, like most of you, my painting desk is a disaster, hence why I wrote that article on paint storage. So, needless to say, I was pretty excited to get myself something to finally help organize my mess. So, you can find The Lazy Painter on Etsy. The current price is only $25, which is very reasonable if you ask me. Also, the diameter is 11″ and it stands about 5″ tall if you’re curious on the size. Once I took the components out of the shipping package I had this. Everything was between bubble wrap and secured in the package. The instructions were very simple, and honestly almost not needed. Putting The Lazy Painter together is very easy. Basically, put the square pegs in the square holes and stack it up. 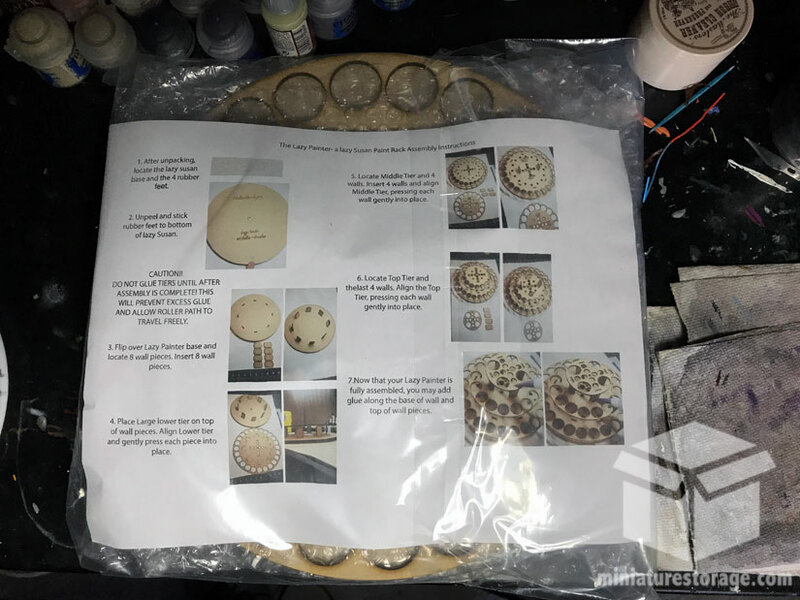 Oh, there are also rubber feet included as well that you stick to the bottom tier to prevent it from sliding around when being spun. Once it was fully assembled I added some super glue to the joints, as indicated in instructions, to make sure everything stays where it needs to be. Overall, I’d say it took me maybe 5 minutes to get everything together. Once The Lazy Painter was assembled, I loaded up all my Vallejo paint bottles. The funny thing is that this holds 44 bottles and that is literally exactly how many I had! Now, there are some holes at the top for paint brushes you can use. However, I already have two paint brush holders, so I decided to stick my two hobby knives in there instead, point down of course. There’s a total of 8 holes for storing things like that, so no doubt I’ll find use for the others as well. Something else I just realized when watching the video they did showing this in use, is that you can store the dropper bottles upside down. I did notice small holes under the bottle area. Well, those holes are for the bottle tip to rest in for upside down storage. I’m going to have to turn those all upside down now as I hear it helps prevent the tips from drying up. The feature I really liked about this product when looking for painting storage solutions was the Lazy Susan style of it, where the unit spins around to access the paints. The Lazy Painter has not disappointed there. The unit spins around freely and easily. Now, it won’t free-spin, and it takes a bit more force than I expected to spin it, but it’s not an issue. It does move easily, don’t get me wrong. I think I was just expecting to be able to nudge it and have it spin. The fact it doesn’t move that easily is probably a good thing though. The Lazy Susan style also interested me on account of space. When you have a lot of paint bottles and pots, there’s only a few good space options available. One of those choices is to go vertical with your storage, like a tall wall rack. The other is something like this product where it maximizes the space it does use. My current painting table setup was more suited to a Lazy Susan approach. The table is deep, and a rack against the back would have been too far to reach easily. However, with The Lazy Painter I can easily reach it and spin it around to get what I need. It works perfectly for my current space. 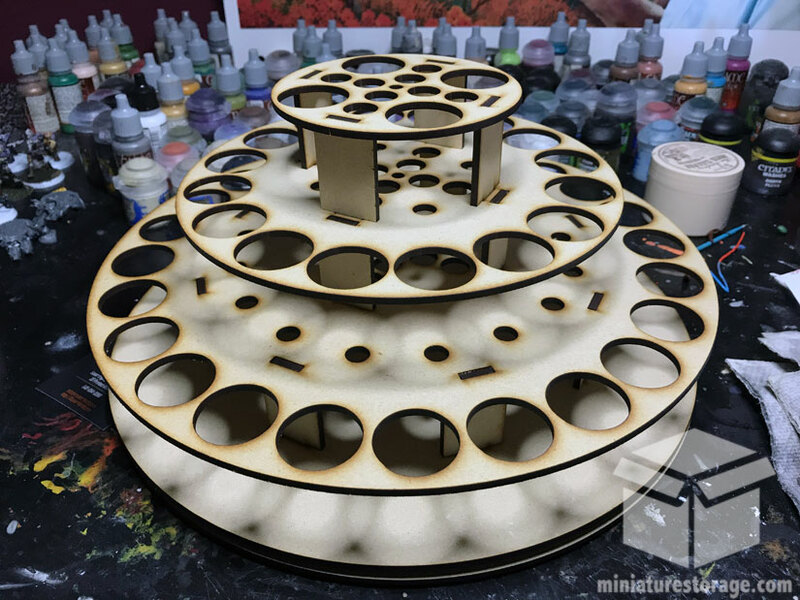 The Lazy Painter is made of MDF and laser cut. Everything fit together well, and with some super glue, holds together well also. The component to spin the unit around seems to be of quality as well. Nothing sounds odd, there’s no issues spinning it, etc. It’s a simple product, not much to critique in this area, but I have no problems with the quality here. I had to organize my desk a bit to fit The Lazy Painter on it. Yes, that’s Bob Ross in the background. He’s my hero. Now it sits at the corner of my desk within reach and with paints all organized – finally! I also don’t have to have had this for long to see the value in it. We painters are particular and we know quickly when we like or dislike something when it comes to organization and tools. And, I can say that I definitely like The Lazy Painter and I highly recommend it to anyone in the market for a setup like this. Extremely affordable, easy to assemble, and works great. 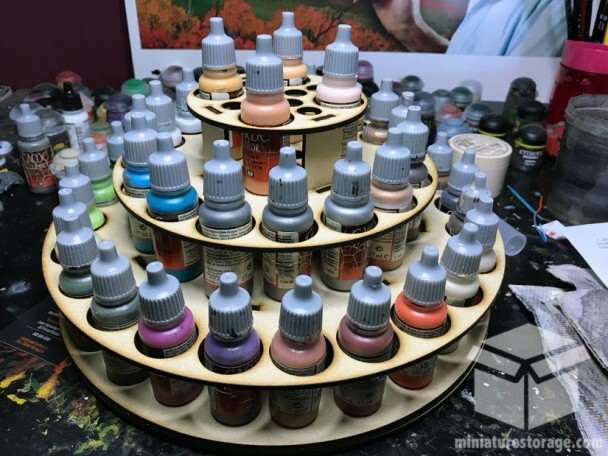 I recommend this to anyone looking to organize their paints.